It will make the perfect gift as it will add style and sophistication to any outfit or occasion. A real modern heirloom jewellery set. 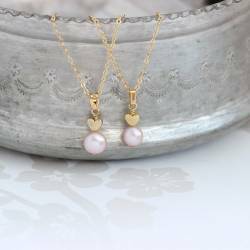 The pendant necklace has a single real freshwater pearl and a 6mm gold heart hand crafted toegther and hangs from a gold plated chain. 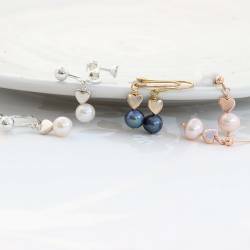 The perfect pearl jewellery gift set for any occasion. Either for you, your bridesmaids, Valentines, Mother's Day or for Christmas. As well as fish hooks or studs we can now put these earrings on gold plated clip on earrings. They are lever back but have an adjustable screwback as well so you can get the perfect fit. The pendant hangs approx 2.5cm from the chain. Length of earrings on fish hooks approx 3cm, length of earrings on studs approx 1.8cm.